I've been having some fun using the GameExporter that comes bundled with Maya. It's really nice to have a well featured exporter that you don't have to write yourself. There is one thing that really bugs me about it though- I just can't find the button to suppress the "Replace files that already exist?" and "Success!" messages. Sure, I like the validation, but when I need to export 100+ files through a batch process it can get a bit tedious. Sooo... rather than doing anything fancy like finding the topmost window and deleting it or whatever, what if I just made it so the GameExporter just, you know, wouldn't do that, and just log to the script editor all nice like. Anyway, you can probably see where this is going. I don't like the dialogue windows, and I would prefer them to just print to the log. Deep inside <InstallDir>\Maya2018\scripts\others are a bunch of scripts tellingly named "gameFbxExporter........mel". Executing that through the script editor now logs my super helpful messages, but without the messy dialogue prompts. Now, you might be thinking, it would be less destructive to have taken the whole original function and maybe, you know, added an option for suppressing the dialogue, and you would be right. But STOMP STOMP GOOD. BATCH EXPORT GOOD. Also tired. Here is a quick code snippet for calling a Python script from Substance Painter and parsing the results. The in/out is very simple, but serves as an example of using the alg.subprocess.check_output function to bridge the JS api and your own Python scripts. // This can be called from the QML UI, or elsewhere in the plugin code. // I put my scripts in a relative path to keep my plugin tidy. // and well communicated conventions, but works well enough. pypath, // Absolute path to interpreter. script_path, // Relative path to the py script. "log_files_of_type", // sys.argv, in this case the python method I'm calling. root, // sys.argv, used as a parameter for my method, in this case, the root directory to find files in. "spp" // sys.argv, used as a parameter for my method, in this case the file type extension to look for. // Convert the file names to the native substance path URL format. Returns a list of all the files with a given extension in the named directory. @param root_dir : the directory to parse. @param ext : the extension to match. # Select the method to run based off of the arguments. # args are  script name,  method name. Subsequent args are arbitrary based on method called. I find that any script I write that passes information back and forth between two different platforms/interpreters usually comes with it's own set of headaches. This kind of string parsing should look familiar to anyone who has done work with Photoshop bridging tools, or who has chosen to wrap the P4 command line interface themselves. Doing Ue4 development on a Mac is not a great experience. https://issues.unrealengine.com/issue/UE-23624 Just ran into this one... cleaning your project in XCode nukes the actual editor. Case in point. Probably familiar to any TA or Engineer who deals with their graphics pipeline, RenderDoc is a tool I have found incredibly useful for debugging graphics in Unreal. Formerly a Crytek internal graphics debugging tool, it was released to the public in 2014. The tool is developed by Baldur Karlsson, and it boggles my mind that a tool this gosh-darn useful has been given to the public for free. Kudos to Baldur and to Crytek. Previously I was using NVIDIA Nsight to view and debug runtime atlased textures, and it was quite slow and somewhat unintuitive to sift through the outputs to find what I was after. RenderDoc on the other hand is not only fairly straight forward to get running, the turn around time to get meaningful output for frame-debugging is extremely rapid. Check it out if you need to know more about your graphics pipeline. I'm pretty late to the whole substance craze, having spent three years in a mobile development environment where textures larger than 512x512 caused eyebrows to raise within the engineering team. But I kept hearing things about it being amazing, so I thought I'd give it a shot. Here is my attempt at a "hand painted" look, based off of similar processes I'd use in Photoshop. The texture is generated using an exported sbsar material and... well, thats it. I saw a nice example online of using a switch to swap out gradient maps in a material which allowed me to create a bunch of looks in the one material. This tool makes me happy. Super quick check-in. Hello world! For the last year or so, I've been working with Echtra Inc. on a great project as a Tools Engineer/Technical Artist guy. The project is using the Unreal Engine, which I like more and more every day. On Windows, C++ plus Visual Studio Pro and Visual Assist is a great combo, and I happily churn through my daily tasks without fighting the tools too much. Not so on my Mac at home. Programming in Unity on a Mac is great! Mono Develop isn't amazing, but it isn't terrible. But Unreal on a Mac. I want it to be fun, I want it to be possible, but I just can't get myself to like, let alone enjoy, XCode. On that, for anyone thinking "well, you could just use blueprints..." etc, I feel it's too much of a shackle to not be able to just dive into the guts of it. C++ or bust. 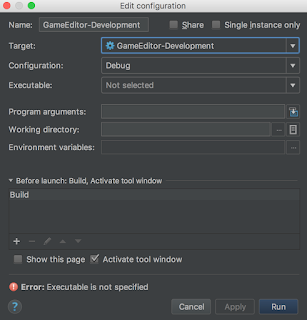 So anyway, I recently adopted PyCharm at work and really enjoyed using it for my Python tools. I noticed that JetBrains also made an IDE called CLion, and they also had recently got it running with Unreal, so I thought, what the hell, why not. Turns out their documentation is missing a couple of important notes, that maybe they take for granted, but after a couple of forum dives I managed to actually get it compiling, and running, my little test project. Once I run through their setup scripts, these were the things I needed to double check. Make sure Mono is installed and up to date, and that the mono command is available in the terminal. 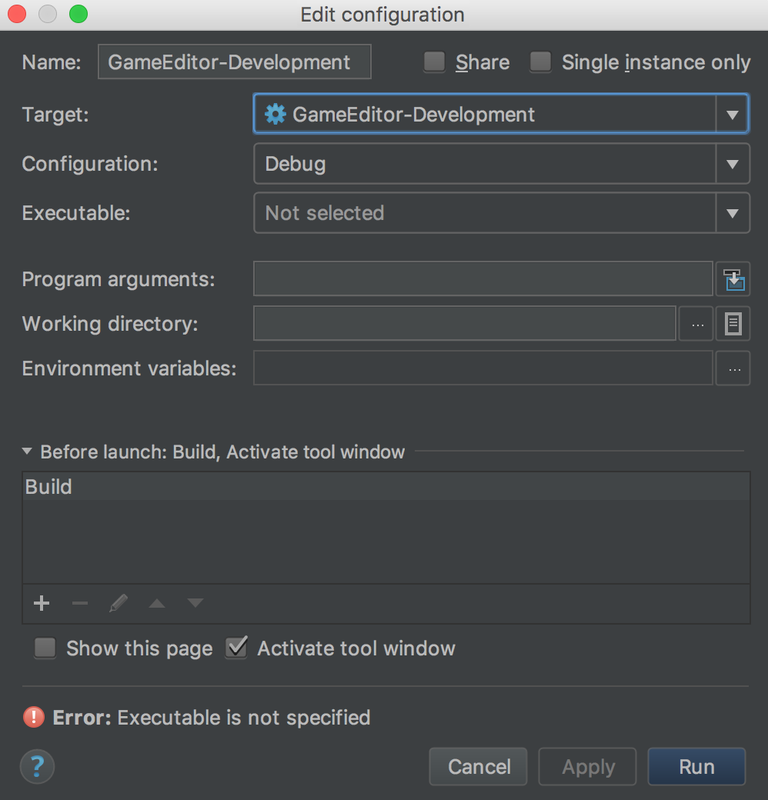 Once you generate your CLion project via the editor (make sure to follow the instructions here) you need to update the generated configs with paths to the editor executable. Finally, now that it's pointing to the editor correctly, add an absolute path to your project's .uproject file in the project arguments.